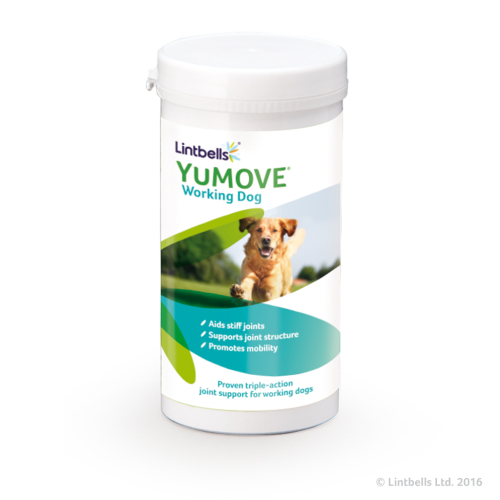 YUMOVE Working Dog is the only supplement on the market that gives all the key ingredients to support your dog’s joint health and maintain energy and stamina. Containing top quality ingredients at levels that provide fast, beneficial and long-term support for joint health. •	Contains triple strength Green Lipped Mussel that reduces stiffness and helps joint recovery. •	Supports joint structure as it contains, Veterinary strength Glucosamine, Chondroitin and Manganese supports the joint cartilage, ligaments and tendons. •	Improves mobility with Hyaluronic Acid that provides cushioning and lubrication aiding shock absorption. •	Contains Beta Glucans that is proven in Nordic Sledge dogs to support energy uptake and stamina to keep dogs working longer. It is recommended to double the daily recommendation for the first four to six weeks to ensure your dog is getting off to a good start, providing them with enough of the key ingredients to support their joints. If your dog is taking more than 1 YUMOVE Working Dog tablet it is recommended that the daily allowance is spread out throughout the day. Please note: this is a VAT free product.